We are committed to sharing resources at no cost whenever possible. This includes sharing electronic versions of Health Promotion in the Workplace reference text and other books authored by Dr. Michael O’Donnell, as well as videos of his presentations. If you choose the free PDF or Kindle option, we will encourage you to Pay It Forward by helping someone else with an unexpected kindness, and tell us how plan to do so in the space provided on the order form. 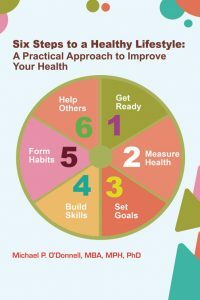 Health Promotion in the Workplace, 5th edition, is a valuable reference for anyone who designs, manages, evaluates or studies workplace health promotion programs. Authored by a team of program managers and scholars who have designed and managed programs in several thousand settings, conducted hundreds of program evaluations, and published thousands of scientific studies on the most effective approaches, this 721-page book provides the rare combination of practical perspective combined with conservative scientific rigor. Earlier editions have been used by tens of thousands of professionals around the world. The overall book is organized around the Awareness, Motivation, Skills and Opportunity (AMSO) Framework, which was first articulated by Dr. Michael P. O’Donnell in 2005. 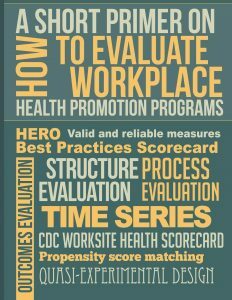 A Short Primer on How to Evaluate Workplace Health Promotion Programs provides an overview of how to evaluate a workplace health promotion program.This workbook provides an overview of how to evaluate a workplace health promotion program. It articulates the value of program evaluation, types of evaluation, methodology to conduct outcomes evaluation, and strategies to conduct the evaluation. We have decided to cut the prices of Health Promotion in the Workplace, 5th edition in half, from $99.95 to $45.95. We are able to do this because we have met our revenue goals for the book and our printer has been able to produce this 700+ book for a remarkably low cost. The PDF version continues to be free. These prices are consistent with our commitment to provide resources at no cost when our costs are minimal, and for as little as possible in other cases. These prices apply to the English version as well as versions translated into Portuguese, Japanese, and the recently released Chinese version.